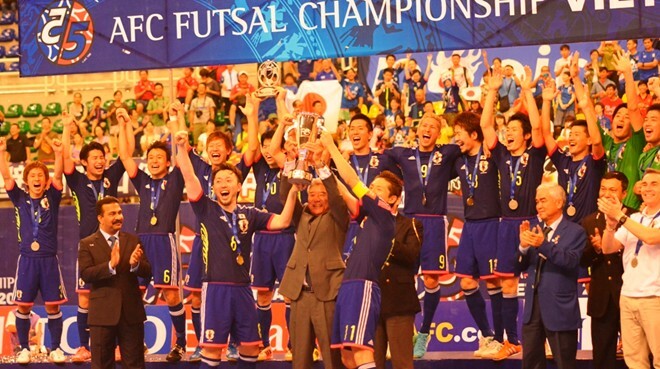 Goalkeeper Yushi Sekiguchi saved three penalties in the shootout as Japan retained the AFC Futsal Championship title following a 2-2 draw after extra-time in Saturday’s final at Phu Tho Stadium. Japan twice came from behind through Kotaro Inaba and an extra-time own goal from Hamid Ahmadi after Farhad Tavakoli and Hossein Tayebi had given 10-time champions Iran the lead. And in the shootout, Sekiguchi saved from Mohammad Taheri, Ghodrat Bahadori and Asghar Hassanzadeh, with Kazuhiro Nibuya, Tomoki Yoshikawa and Akira Minamoto converting for Japan to seal a 3-0 victory. After Japan had beaten Kuwait in the semi-finals and Iran had eased past Uzbekistan, the highly-anticipated final started at a high tempo and it was Iran goalkeeper Alireza Samimi who was first called into action to deny Manabu Takita after just 30 seconds. Sekiguchi then denied Hassanzadeh at the other end on three minutes before the Japan custodian stopped Vahid Shafiei’s header from point blank range. And with the momentum in their favour, Iran opened the scoring after eight minutes when Tayebi pulled the ball back for Tavakoli to drill a low shot through a crowded penalty area and past Sekiguchi. The Japan goalkeeper then almost handed Iran a second in the 12th minute when he tried to chip a ball forward only for the pass to be cut out by Shafiei, but fortunately Sekiguchi was able to recover to block the resulting shot. 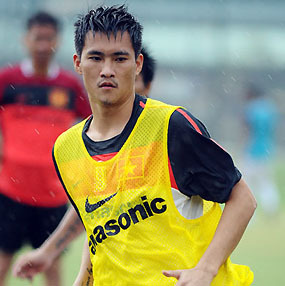 Sekiguchi then saved from Mohammad Shajari after Nobuya Osodo had been caught in possession on the halfway line a minute before half-time. Iran kept Sekiguchi busy after half-time, but despite Japan struggling to find a foothold in the game, they levelled the tie in the 26th minute as Inaba’s free-kick went under the wall and through the legs of Samimi. And Japan almost completed the comeback with four minutes remaining as Alireza Vafaei’s handball on the halfway line brought up Iran’s the sixth team foul, but Inaba fired wide from the resulting penalty. There was, though, still time for Iran to have their chance to claim the title as Sekiguchi denied Hassanzadeh with just four seconds remaining to send the tie to extra-time. But Iran were not to be denied just two minutes into the first half of extra-time as Tayebi was allowed to turn after receiving Vafaei’s pass and he fired his shot under the body of Sekiguchi. Japan coach Miguel Rodrigo eventually responded in the second half of extra-time by introducing Osodo in place of goalkeeper Sekiguchi. And the move paid off after just 40 seconds as Ahmadi deflected Tomoaki Watanabe’s low shot into his own net. Japan almost snatched victory with 40 seconds remaining, but Nibuya blazed over from close range to send the tie to penalties. Nibuya, though, was able to set Japan on their way in the shootout before Sekiguchi denied Taheri. Yoshikawa then extended the lead via the crossbar before Sekiguchi again saved from Bahadori. And after Minamoto drilled his penalty past Samimi, Sekiguchi saved from Hassanzadeh to hand Japan a third AFC Futsal Championship title.